Patriot released their latest line of DDR4 memory called Viper Elite. These kits can deliver up to 3200 MHz and provide a more affordable option than some of the ultra high performance DDR4 kits available. 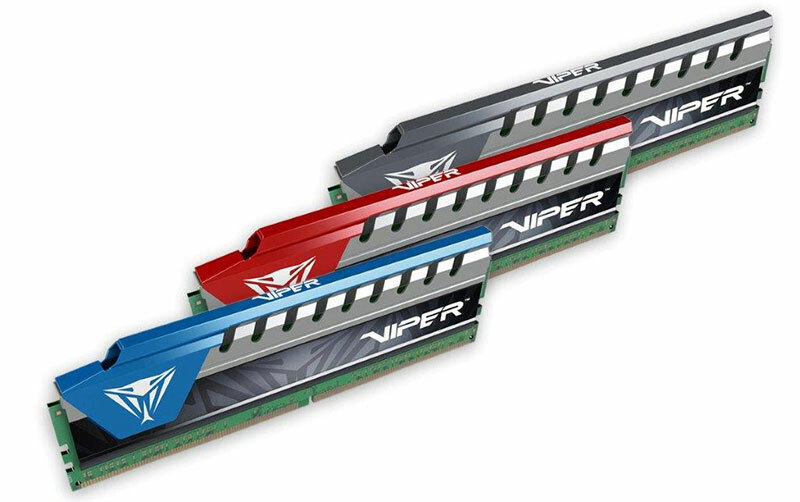 Viper Elite memory is available as of November 18th at major retailers and is available in up to 64GB capacity. Red, blue, and grey varieties will be available with pricing from $52.99 to $499.00. Patriot, a leading manufacturer of computer memory, USB/flash memory, SSDs, mobile accessories, and gaming peripherals today announced the Viper Elite DDR4 memory intended for the latest Intel® 100 series platform. For 30 years, Patriot has manufactured computer memory with the goal of providing high quality DIMMs with an affordable price. The Viper Elite is Patriot’s latest offering of DDR4 aimed at consumers looking to upgrade their systems without emptying their pockets. Available in red, blue, and grey 16GB (2x8GB) and 8GB (2x4GB) dual kits and a 64GB (4x16GB) quad kit and 32GB (2x16GB) dual kit, in grey only, the Viper Elite pulls as low as 1.2V and as high as 1.35V to allow for ideal power consumption. Delivering speeds of up to 3000MHz in all colors, with the grey heatshield offering an additional 3200MHz option, the Viper Elite provides a better gaming experience on the latest platforms to gamers everywhere looking for an affordable, yet reliable upgrade for their battle station. Available in three color combinations, the Viper Elite will be available in blue/grey, red/grey and a grey to offer modders a variety of options when constructing their build. It's just weird that Patriot sticks to green PCB. I've already seen that latest Viper 4 kits were with black PCB ( even though on photos are green ). I also don't know why older, Viper 4 series are available in stores up to DDR4-3600 while Viper Elite only up to DDR4-3200.